Spider-Man's Globetrotting Adventure Against The Sinister Six Moves To The Middle East For A Face Off Against�The Sandman! 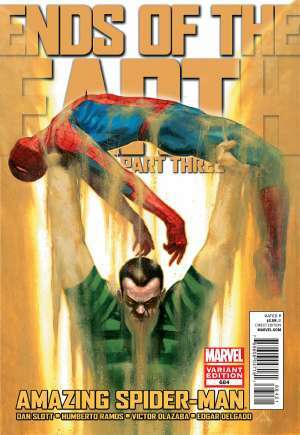 � In The Past, Spidey's Fought Sandman On Beaches, In Quarries, But Never Like This - How Can Web-Head Hope To Defeat Sandman When He's Controlling The Sahara Desert?! 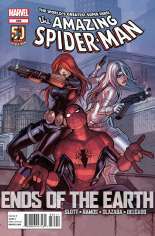 � Special Guest Stars: Black Widow And Silver Sable. 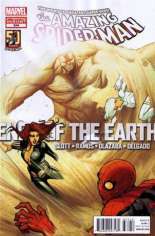 Published April, 2012 (Modern Age) by Marvel Comics and went on sale April 18, 2012 for $15.00 USD. This issue contains 32 pages in Color, the current NM value is $15.00 USD. The publisher has rated this issue T (9+). Nice, solid issue! 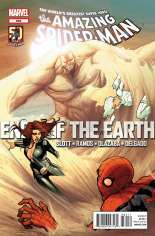 Dan Slott continues to bring us some spectacular Spider-Man stories, and Humberto Ramos delivers with exceptional art. I can't wait for the showdown with Spidey, Black Widow, Silver Sable, and Mysterio! 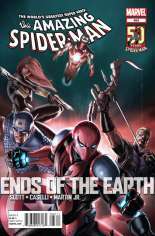 Ends of the Earth is really gearing up to be a memorable Spidey storyline!